Have you found an online vendor selling Dictador Best of 1977? I expected the typical overdone cocoa/coffee artificial additives, but this one drinks like agricole/navy with slight lemon tone. The ABV was too high, 44 something, so not a pleasant drink after all. Not there yet. Thank you Weinquelle in Hamburg for such a nice surprise! 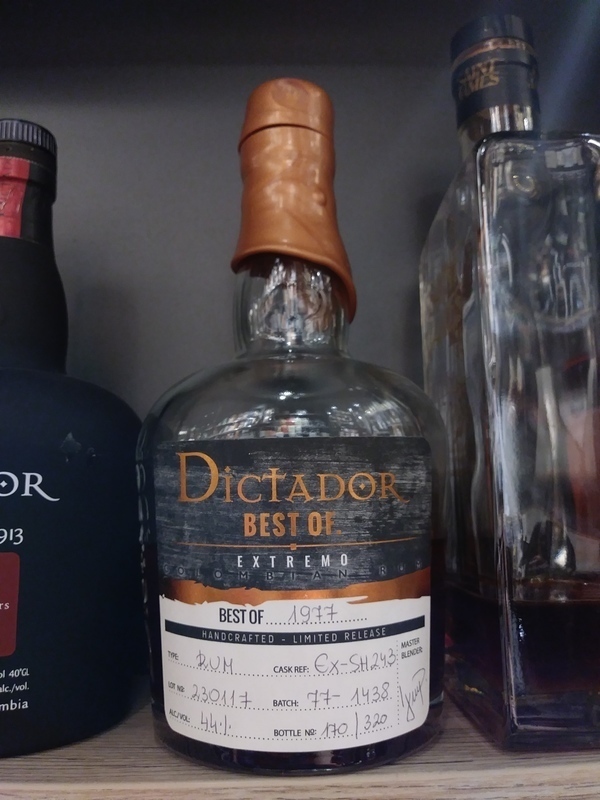 I walked into the local liquor store searching for something new and got a glass of Dictador Best of 1977 to try for free. Such a rare bottle to find in the US, and so expensive. Very nice high end hand written label. Deep mahogany color. Very dry compared to Dictador XO range, but the familiar coffee is right there on your nose and palate. I prefer the XO Insolent over this one, but it was still a great experience to try it out.